Former WW Andy Hatcher (left) with WWMP Founder Lee Miller. 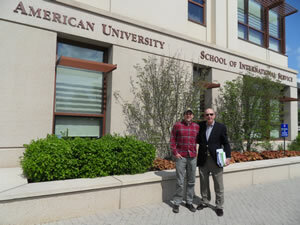 Andy is pursuing his Bachelor’s Degree in International Relations at American University in Washington, DC. Lee is Andy’s former Mentor. The planning of Long Term Education begins while the Wounded Warrior is in outpatient status at the MTF. Assist them in selecting a career path and related education path to matriculate for a degree that fits the career path selected for example for a Law Enforcement Career, a Bachelors in Criminal Justice would be recommended. Assist them in selecting and applying to a university or college of their choice and location to fit the selected career path and location that best fits their future plans. Assist them in taking the necessary Preparatory Courses to pass such qualification exams for degree programs such as the SAT, GMAT, GRE, LSAT and MEDCAP. Work with the college and university and assist the Wounded Warrior and to obtain an official acceptance to the educational institution prior to discharge and reporting to the VA.
Work with the Wounded Warrior and the Warrior Transition Unit as he/she goes through the MEB and PEB Board process leading to the selection of benefits under the Post 9/11 GI Bill or the VA Vocational Rehabilitation Program. Advise the Wounded Warrior and spouse on the LT Education Programs available. Provides a BAH based on the cost of living of the school in which enrolled and prorated on the days enrolled in the school. Provides for books and allowances. Provides for transfer of up to 36 months of education benefits to spouses and children under certain conditions. Provides for 48 months of education of full tuition. Provides for a BAH based on the cost of living for the school in which enrolled prorated based on attendance. Provides for 45 months of education for a Spouse or Children for a Wounded Warrior who is declared 100% disabled. If it is believed by precedence that Wounded Warrior will be totally disabled by the DoD and VA MEB Board, the Wounded Warrior may submit and get an approval enabling the Wounded Warrior’s spouse or children to begin using the benefit without waiting for the board process to declare the Wounded Warrior 100% disabled. This article provides information about how courses taken by wounded Warriors at Walter Reed, Ft Meade or Ft Belvoir can be transferred to colleges and universities by the Wounded Warrior once discharged or goes home all around the country or overseas.